Contemporary lithograph of the Battle of Batoche . Conflicts in the District of Saskatchewan in 1885 with the Southbranch Settlements circled in black. The North-West Rebellion (or the North-West Resistance, Saskatchewan Rebellion, Northwest Uprising, or Second Riel Rebellion) of 1885 was a brief and unsuccessful uprising by the Métis people of the District of Saskatchewan under Louis Riel against the government of Canada. During a time of great social change in Western Canada, the Métis believed that the Canadians had failed to address the protection of their rights, their land and their survival as a distinct people. Despite some notable early victories at Duck Lake, Fish Creek and Cut Knife, the rebellion effectively ended for the Métis with their defeat at the siege of Batoche, Saskatchewan, the eventual scattering of their allied Aboriginal forces elsewhere, and the trial and hanging of Louis Riel. Tensions between French Canada and English Canada increased for some time. Due to the role that the Canadian Pacific Railway played in transporting troops, political support increased and Parliament authorized funds to complete the country's first transcontinental railway. After the Red River Rebellion of 1869–1870, many of the Métis moved from Manitoba to the Fort Carlton region of the Northwest Territories, where they founded the Southbranch settlements of Fish Creek, Batoche, St. Laurent, St. Louis and Duck Lake on or near the South Saskatchewan River. In 1882 surveyors began dividing the land of the newly formed District of Saskatchewan in the square concession system. 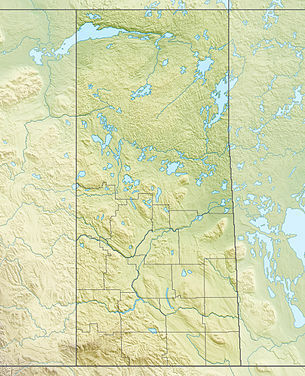 The Métis lands were laid out in the seigneurial system of strips reaching back from a river which the Métis were familiar with in their French-Canadian culture. Not having clear title they feared losing their land. In 1884 the Métis (including the Anglo-Métis) asked Louis Riel to return from the United States, where he had fled after the Red River Rebellion, to appeal to the government on their behalf. The government gave a vague response. In March 1885, Riel, Gabriel Dumont, Honoré Jackson (a.k.a. Will Jackson), and others set up the Provisional Government of Saskatchewan, believing that they could influence the federal government in the same way as they had in 1869. The role of aboriginal peoples prior to — and during — the outbreak of the rebellion is often misunderstood. A number of factors have created the misconception that the Cree and Métis were acting in unison. By the end of the 1870s the stage was set for discontent among the aboriginal people of the prairies: the bison population was in serious decline (creating enormous economic difficulties) and, in an attempt to assert control over aboriginal settlement, the federal government often violated the terms of the treaties it had signed during the latter part of the decade. Thus, widespread dissatisfaction with the treaties and rampant poverty spurred Big Bear, a Cree chief, to embark on a diplomatic campaign to renegotiate the terms of the treaties (the timing of this campaign happened to coincide with an increased sense of frustration among the Métis). When the Cree initiated violence in the spring of 1885, it was almost certainly unrelated to the revolt of Riel and the Métis (which was already underway). In both the Frog Lake Massacre and the Siege of Fort Battleford, small dissident groups of Cree men revolted against the authority of Big Bear and Poundmaker. Although he quietly signalled to Ottawa that these two incidents were the result of desperate and starving people and were, as such, unrelated to the rebellion, Edgar Dewdney, the lieutenant-governor of the territories, publicly claimed that the Cree and the Métis had joined forces. For Riel and the Métis, several factors had changed since the Red River Rebellion. The railway had been completed across the prairies in 1883, though sections were still under construction north of Lake Superior, making it easier for the government to get troops into the area. 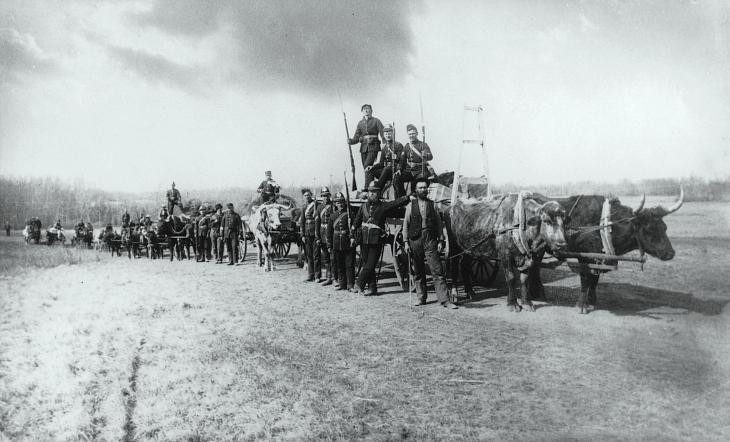 In addition, the North-West Mounted Police (NWMP) had been created, developing an armed local force. Riel lacked support from English settlers of the area as well as many of the non-Métis natives. Riel's belief that God had sent him back to Canada as a prophet caused the Catholic Church to withdraw its support for his actions. The Catholic priest, Albert Lacombe, worked to obtain assurances from Crowfoot that his Blackfoot warriors would not participate in a rebellion. On March 26, 1885, the 150 to 200 Métis and Aboriginal warriors under the command of Gabriel Dumont defeated a combined group of 90 Prince Albert Volunteers and North-West Mounted Police led by their superintendent Leif Newry Fitzroy Crozier at Duck Lake, outside Batoche. In response, the federal government sent Major General Frederick Middleton in command of 3,000 troops to the area, where Middleton incorporated another 2,000, mostly English-Canadian volunteers and 500 North-West Mounted Police into his force. On March 30, 1885, a raiding party of Cree people, short of food due to declining bison populations, approached Battleford. The white inhabitants fled to the nearby North-West Mounted Police post, Fort Battleford. The Crees then took food and supplies from the empty stores and houses. In an argument, an Indian Agent named Rae was shot and killed. On April 2, 1885, near Frog Lake, Saskatchewan (now in Alberta) a Cree raiding party led by Wandering Spirit attacked a small town. Angered by what seemed to be unfair treaties and the withholding of vital provisions by the Canadian government,and also by the dwindling buffalo population, their main source of food, Big Bear and his Cree decided to rebel after the successful Métis victory at Duck Lake. They gathered all the white settlers in the area into the local church. They killed Thomas Quinn, the town's Indian Agent, after a disagreement broke out. The Cree then attacked the settlers, killing eight more and taking three captive. On April 15, 1885, 200 Cree warriors descended on Fort Pitt. They intercepted a police scouting party, killing a constable, wounding another, and captured a third. Surrounded and outnumbered, garrison commander Francis Dickens (son of novelist Charles Dickens) capitulated and agreed to negotiate with the attackers. Big Bear released the remaining police officers but kept the townspeople as hostages and destroyed the fort. Six days later, Inspector Dickens and his men reached safety at Battleford. On May 2, 1885, the Cree war chief Fine-Day defeated Lieutenant Colonel William Otter at the Battle of Cut Knife near Battleford. Despite their use of a Gatling gun, a flying column of Canadian militia and army regulars, government forces were defeated. Fine-Day was affiliated with the chief Poundmaker. Big Bear would not get involved. On May 9, 1885, Middleton attacked Batoche itself. The greatly outnumbered Métis ran out of ammunition after three days of battle and siege. In the end, the Métis resorted to firing sharp objects and small rocks from their guns, until they were forced to retreat when Middleton's soldiers advanced in force. Riel surrendered on May 15. Gabriel Dumont and other participants escaped across the border to the Montana Territory of the United States. On May 28, 1885, Major General Thomas Bland Strange brought an NWMP detachment from Calgary, Alberta, but they were unable to defeat a Cree force under Big Bear who carried the day at Frenchman's Butte at the end of May. On June 3, 1885, a small detachment of North-West Mounted Police under the command of Major Sam Steele caught up to a band of Cree led by Big Bear who were moving northward after their victory at Frenchman's Butte. The Cree were almost out of ammunition, and were forced to flee after a short exchange of fire and the release of their hostages. Métis and First Nation prisoners following the rebellion, August 1885. Demoralized, defenceless, and with no hope of relief after the surrender of the Métis and Poundmaker, most of the Cree surrendered over the next few weeks. Big Bear was captured near Fort Carlton on an island in the Saskatchewan River about July 1 by the North-West Mounted Police. The government was able to pacify the Cree and Assiniboine by sending them food and other supplies. Poundmaker and Big Bear were sentenced to prison, and eight other Aboriginal leaders were hanged. Riel was tried and hanged as well, sparking a national controversy between French and British Canada. The Canadian Pacific Railway (CPR) played a key role in the government's response to the Rebellion, as it was able to transport federal troops to the area quickly. While it had taken three months to get troops to the Red River Rebellion, the government was able to move forces in nine days by train in response to events in the North-West Territories. The successful operation increased political support for the floundering and incomplete railway, which had been close to financial collapse. The government authorized enough funds to finish the line. Thus Prime Minister John A. Macdonald was able to realize his National Dream of linking Canada across the continent. In what is now Saskatchewan, shortly after the fighting, the first modern-style election took place in the North-West Territories election of 1885. The Scrip Commission was dispatched to the District of Saskatchewan to address the issue of Métis land claims. Fort Carlton Provincial Historic site has been rebuilt as it had been ravaged by three separate fires. Big Bear (Mistahimaskwa) had used the site in his initial negotiations for Treaty Six in about 1884, and finally, the following year he surrendered here after his engagement at Steele Narrows. The Prince Albert blockhouse was employed by the North-West Mounted Police on evacuating from Fort Carlton after the first fire. Duck Lake is home to the Duck Lake Historical Museum and the Duck Lake Regional Interpretive Centre, and murals which reflect the history of the Rebellion in the area. The Battle of Duck Lake, the Duck Lake Massacre, and a buffalo jump are all located here. The "First Shots Cairn" was erected on Saskatchewan Highway 212 as a landmark commemorating the scene of the first shots in the Battle of Duck Lake. The Our Lady of Lourdes Shrine at St. Laurent north of Duck Lake is a local pilgrimage site. The Battle of Fish Creek National Historic Site, the name has been changed to Tourond's Coulee / Fish Creek National Historic Site to preserve the battlefield of April 24, 1885, at la coulée des Tourond , Madame Tourond’s home, early Red River cart Fish Creek Trail and the site of Middleton’s camp and graveyard. "North West Rebellion - Fish Creek - While General Middleton was moving to capture Batoche his forces were attacked on the 24th April 1885, by the Half-breeds under Gabriel Dumont from concealed rifle pits near the mouth of Fish Creek. The rebels were defeated and driven from the field. Erected 1933." The Marr Residence is a municipal heritage property of Saskatoon which served as a field hospital for wounded soldiers of the rebellion. Fort Otter was constructed at Battleford's government house located at the capital of the North-West Territories. Poundmaker was arrested at Fort Battleford and eight first nation men were hung in the aftermath of the Frog Lake Massacre. Fort Battleford has been declared a National Historic site of Canada to commemorate its role as military base of operations for Cut Knife Hill, Fort Pitt, as a refuge for 500 area settlers and its role in the Siege of Battleford. Fort Pitt, the scene of the Battle of Fort Pitt, is a Provincial Park and National Historic site where a National Historic Sites and Monuments plaque designates where Treaty six was signed. Frog Lake Massacre National Historic Site of Canada, at Frog Lake, Alberta, is the location of the Cree uprising which occurred in the District of Saskatchewan North-west Territories. Frenchman Butte is a National Historic Site of Canada, which locates the theatre of the 1885 battle staged between Cree and Canadian troops. "Cut Knife Battlefield. Named after Chief Cut Knife of the Sarcee in an historic battle with the Cree. On 2nd May 1885, Lt. Col. W. D. Otter led 325 troops composed of North-West Mounted Police, "B" Battery, "C" Company, Foot Guards, Queen's Own and Battleford Rifles, against the Cree and Assiniboine under Poundmaker and Fine Day. After an engagement of six hours, the troops retreated to Battleford." Sanderson Bay, in the Makwa Lake Provincial Park, was the site of the last engagement of the rebellion. Steele Narrows Provincial Historic Park conserves the lookout point of a Cree burial ground. The Royal Canadian Mounted Police training depot was established in 1874, and still survives. The RCMP chapel frame building was built in 1885 is still standing which was used to jail Indian prisoners. One of three Territorial Government Buildings remains on Dewdney Avenue in the provincial capital city of Regina which was the site of the Trial of Louis Riel, where the drama the Trial of Louis Riel is still performed. Following the May trial, Louis Riel was hang November 16, 1885. The RCMP Heritage Centre, in Regina, opened in May 2007. The Métis brought his body to Saint-Vital, his mother's home, now the Riel House National Historic Site, and then interred at the Saint-Boniface Basilica in Manitoba, his birthplace, for burial. Highway 11, stretching from Regina to just south of Prince Albert, has been named Louis Riel Trail by the province; the roadway passes near locations of the 1885 rebellion. ↑ 1.0 1.1 1.2 Panet, Charles Eugène (1886). "Report upon the suppression of the rebellion in the North-West Territories and matters in connection therewith, in 1885: Presented to Parliament.". Department of Militia and Defence. http://peel.library.ualberta.ca/bibliography/1519/1.html. ↑ Mulvaney, Charles Pelham (1885). "The history of the North-West Rebellion of 1885 (The Troops in the Field) p.422". A.H. Hovey & Co. http://peel.library.ualberta.ca/bibliography/1508/422.html. ↑ Panet, Charles Eugène (1886). "Report upon the suppression of the rebellion in the North-West Territories and matters in connection therewith, in 1885: Presented to Parliament.(p.20)". Department of Militia and Defence. http://peel.library.ualberta.ca/bibliography/1519/45.html. ↑ 4.0 4.1 4.2 4.3 Panet, Charles Eugène (1886). "Report upon the suppression of the rebellion in the North-West Territories and matters in connection therewith, in 1885: Presented to Parliament.". Department of Militia and Defence. http://peel.library.ualberta.ca/bibliography/1519/15.html. ↑ 5.0 5.1 John Chaput (2007). "Frog Lake Massacre". The Encyclopedia of Saskatchewan. University of Regina and Canadian Plains Research Center. http://esask.uregina.ca/entry/frog_lake_massacre.html. Retrieved 8 June 2010. ↑ 6.0 6.1 Mulvaney, Charles Pelham (1885). "The history of the North-West Rebellion of 1885 p.327". A.H. Hovey & Co. http://peel.library.ualberta.ca/bibliography/1508/328.html. ↑ 7.0 7.1 7.2 "NORTH-WEST RESISTANCE". Encyclopedia of Saskatchewan. Canadian Plains Research Center, University of Regina. 2006. http://esask.uregina.ca/entry/north-west_resistance.html. Retrieved 2013-09-17. ↑ Henry Thomas McPhillips (1888). "McPhillips' alphabetical and business directory of the district of Saskatchewan, N.W.T. : Together with brief historical sketches of Prince Albert, Battleford and the other settlements in the district, 1888 (pages 93-97)". Henry Thomas McPhillips. http://peel.library.ualberta.ca/bibliography/1740/115.html. ↑ "FRENCH AND MÉTIS SETTLEMENTS". Encyclopedia of Saskatchewan. Canadian Plains Research Center, University of Regina. 2006. http://esask.uregina.ca/entry/french_and_metis_settlements.html. Retrieved 2013-09-17. ↑ Miller, J. R. Skyscrapers Hide The Heavens: A History of Indian-White Relations in Canada. Toronto: University of Toronto Press, 1989. 171. ↑ Miller, J. R. Skyscrapers Hide The Heavens: A History of Indian-White Relations in Canada. Toronto: University of Toronto Press, 1989. 174. ↑ Friesen, Gerald. The Canadian Prairies: A History. Tonronto: University of Toronto Press, 1984. 226. ↑ Miller, J. R. Skyscrapers Hide The Heavens: A History of Indian-White Relations in Canada. Toronto: University of Toronto Press, 1989. 182. ↑ Ray, Arthur J. I Have Lived Here Since The World Began: An Illustrated History of Canada's Native People. Toronto: Key Porter Books, 2005. 221. ↑ Dempsey, Hugh A. (1957). The Early West. Edmonton: Historical Society of Alberta. p. 21. http://www.ourfutureourpast.ca/loc_hist/page.aspx?id=245933. ↑ Mulvaney, Charles Pelham (1885). "The history of the North-West Rebellion of 1885 (The Duck Lake Disaster) p.30". A.H. Hovey & Co. http://peel.library.ualberta.ca/bibliography/1508/30.html. ↑ Mulvaney, Charles Pelham (1885). "The history of the North-West Rebellion of 1885 (The War Cloud Bursts on Battleford) p.76". A.H. Hovey & Co. http://peel.library.ualberta.ca/bibliography/1508/76.html. ↑ Dempsey, Hugh A. (1957). The Early West. Edmonton: Historical Society of Alberta. p. 1. http://www.ourfutureourpast.ca/loc_hist/page.aspx?id=245913. ↑ William Bleasdell Cameron (1888). "The war trail of Big Bear (The Frog Lake Massacre)". Ryerson Press. http://peel.library.ualberta.ca/bibliography/1360/76.html. ↑ William Bleasdell Cameron (1888). "The war trail of Big Bear (The Fall of Fort Pitt)". Ryerson Press. http://peel.library.ualberta.ca/bibliography/1360/129.html. ↑ Mulvaney, Charles Pelham (1885). "The history of the North-West Rebellion of 1885 (The Battle of Fish Creek) p.127". A.H. Hovey & Co. http://peel.library.ualberta.ca/bibliography/1508/128.html. ↑ Mulvaney, Charles Pelham (1885). "The history of the North-West Rebellion of 1885 (The Battle of Cut Knife Creek) p.156". A.H. Hovey & Co. http://peel.library.ualberta.ca/bibliography/1508/157.html. ↑ Panet, Charles Eugène (1886). "Report upon the suppression of the rebellion in the North-West Territories and matters in connection therewith, in 1885: Presented to Parliament.". Department of Militia and Defence. http://peel.library.ualberta.ca/bibliography/1519/51.html. ↑ Mulvaney, Charles Pelham (1885). "The history of the North-West Rebellion of 1885 (The Battle at Batoche's Ferry) p.197". A.H. Hovey & Co. http://peel.library.ualberta.ca/bibliography/1508/197.html. ↑ William Bleasdell Cameron (1888). "The war trail of Big Bear (The Battle of Frenchman's Butte)". Ryerson Press. http://peel.library.ualberta.ca/bibliography/1360/202.html. ↑ William Bleasdell Cameron (1888). "The war trail of Big Bear (Battle of Loon Lake)". Ryerson Press. http://peel.library.ualberta.ca/bibliography/1360/227.html. ↑ William Bleasdell Cameron (1888). "The war trail of Big Bear (The Indian Trials)". Ryerson Press. http://peel.library.ualberta.ca/bibliography/1360/240.html. ↑ "Northwest "Half-breed" Scrip". Métis National Council Historical Database. http://metisnationdatabase.ualberta.ca/MNC/scrip1.jsp. Retrieved 20013-11-212. ↑ "Our Legacy (Metis Scrip)". University of Saskatchewan. http://scaa.sk.ca/ourlegacy/exhibit_scrip. Retrieved 20013-11-212. ↑ "Tourism agencies to celebrate the 125th anniversary of the Northwest Resistance/Rebellion". Home/About Government/News Releases/June 2008. Government of Saskatchewan. June 7, 2008. http://www.gov.sk.ca/news?newsId=3ceddf25-86ef-4433-86ea-cfe3cc69472d. Retrieved 2009-09-20. ↑ "Batoche The Virtual Museum of Métis History and Culture". Gabriel Dumont Institute of Native Studies and Applied Research. http://www.metismuseum.ca/browse/index.php/484. Retrieved 2009-09-20. ↑ "Parks Canada Batoche National Historic Site of Canada". Government of Canada. 2009-06-22. http://www.pc.gc.ca/eng/lhn-nhs/sk/batoche/index.aspx. Retrieved 2009-09-20. ↑ Historic Sites and Monuments board of Canada. Government of Canada (21-Nov-2004). "Welcome To Saskatoon, Saskatchewan Region Gen Web Batoche / Fish Creek Photo Gallery". Saskatoon Gen Web. online by Julia Adamson. http://www.rootsweb.ancestry.com/~sksaskat/batoche/batoche-letendre.html. Retrieved 2009-09-20. ↑ "Fort Carlton Provincial Park - Tourism, Parks, Culture and Sport -". Government of Saskatchewan. http://www.tpcs.gov.sk.ca/FortCarlton. Retrieved 2009-09-20. ↑ "Virtual Saskatchewan - Fur Trading at Fort Carlton". 1997-2007. http://www.virtualsk.com/current_issue/trading_in_fur.html. Retrieved 2009-09-20. ↑ 36.0 36.1 Payette, Pete; Phil Payette (2006). "Saskatchewan Forts: Northwest Rebellion". 2006 American Forts Network. http://www.northamericanforts.com/Canada/sk.html. Retrieved 2009-09-20. ↑ "History of Duck Lake and Area". Duck Lake Regional Interpretive Centre. http://www.dlric.org/history.html. Retrieved 2009-09-20. ↑ "Attractions and Tourism - Town of Duck Lake, Saskatchewan". M.R. Internet. Town of Duck Lake. 2007. http://ducklake.ca/visiting/attractions.php. Retrieved 2009-09-20. ↑ McLennan, David (2006). "Duck Lake - The Encyclopedia of Saskatchewan". Canadian Plains Research Center University of Regina. http://esask.uregina.ca/entry/duck_lake.html. Retrieved 2009-09-20. ↑ "Battleford, Batoche & Beyond tour along the Yellowhead Highway". Yellowhead IT! Travel Magazine. Yellowhead Highway Association. http://www.yellowheadit.com/saskatchewan/tours/battleford_batoche_and_beyond.php. Retrieved 2009-09-20. ↑ "Fish Creek The Virtual Museum of Métis History and Culture". Gabriel Dumont Institute of Native Studies and Applied Research. http://www.metismuseum.ca/browse/index.php/635. Retrieved 2009-09-20. ↑ "Municipal Heritage Properties - Marr Residence". City of Saskatoon - Development Services Branch. 2007. http://www.saskatoon.ca/org/development/services/heritage_properties/marr_residence.asp. Retrieved 2009-03-20. ↑ Men of the city, Committee of the Historical Association of Saskatoon (Published online 30-Jan-2005). "Saskatoon Gen Web Project - Narratives of Saskatoon 1882-1912" (Published online Julia Adamson). University of Saskatchewan Book store. http://www.rootsweb.ancestry.com/~sksaskat/NarrativesOfSaskatoon/outstandingevents.html. Retrieved 2009-09-20. ↑ "Marr Residence". Meewasin Valley Authority. 2007. http://www.meewasin.com/education/marr/. Retrieved 2009-03-20. ↑ "Saskatchewan settlement experience". 1880-1890 - North-west Rebellion The 'siege of Battleford' as reported in the Saskatchewan Herald.. Saskatchewan Archives Board Site by OH! Media - Regina Web Design. 2005. http://www.sasksettlement.com/display.php?cat=1880-1890&subcat=North-West%20Rebellion&id=1136. Retrieved 2009-09-20. ↑ "Parks Canada - Fort Battleford National Historic Site - History". Government of Canada. 2009-06-22. http://www.pc.gc.ca/eng/lhn-nhs/sk/battleford/natcul/histo.aspx. Retrieved 2009-09-20. ↑ Yanko, Dave (1997-2007). "Virtual Saskatchewan - Fort Battleford National Historic Site". http://www.virtualsk.com/current_issue/fort_battleford.html. Retrieved 2009-09-20. ↑ "Fort Pitt Provincial Park - Tourism, Parks, Culture and Sport -". Government of Saskatchewan. http://www.tpcs.gov.sk.ca/FortPitt. Retrieved 2009-09-20. ↑ "Fort Pitt brochure Fort Pitt and the 1885 Resistance/Rebellion". Government of Saskatchewan. http://www.tpcs.gov.sk.ca/FortPittBrochure. Retrieved 2009-09-20. ↑ Beal, Bob (1 September 2007). "Fort Pitt". Historica-Dominion. The Canadian Encyclopedia Historica foundation. http://www.thecanadianencyclopedia.com/index.cfm?PgNm=TCE&Params=A1ARTA0002956. Retrieved 2009-09-20. ↑ "Parks Canada - National Historic Sites in Alberta - National Historic Sites in Alberta". Government of Canada. http://www.pc.gc.ca/eng/docs/r/ab/sites/lhn-nhs1.aspx. Retrieved 2009-09-20. ↑ "Parks Canada - National Historic Sites of Canada - administered by Parks Canada". Government of Canada. 2009-01-20. http://www.pc.gc.ca/progs/lhn-nhs/recherche-search_e.asp?s=1. Retrieved 2009-09-20. ↑ Chaput, John (2006). "Frog Lake Massacre". Canadian Plains Research Center University of Regina. http://esask.uregina.ca/entry/frog_lake_massacre.html. Retrieved 2009-09-20. ↑ "Our Legacy". University of Saskatchewan Archives, University of Saskatchewan Library, and Pahkisimon Nuye?ah Library System. 2008. http://scaa.sk.ca/ourlegacy/solr?query=Place%3A%22Canada!!Saskatchewan!!Cut%20Knife%20Hill%22&mode=results. Retrieved 2009-09-20. ↑ Brown., Brian M (July 4, 2002). "Poundmaker Historical Centre and Big Bear monument". http://www.westerntour.com/1885Reb/R-CKstry.htm. Retrieved 2009-09-20. ↑ McLennan, David (2006). "Cut Knife". Canadian Plains Research Center University of Regina. http://esask.uregina.ca/entry/cut_knife.html. Retrieved 2009-09-20. ↑ Yanciw, David (August 10, 2001). "Town of Cut Knife, Saskatchewan". Big Things of Saskatchewan. http://www.bigthings.ca/sask/cutknife.html. Retrieved 2009-09-20. ↑ Davidson, Keith (2002). "Everyone Chuckled - A Rebellion Story Taking From Keith Davidson's "Looking Back Series"". Saskatchewan Indian First Nations Periodical Index Search Winter 2002 v31 n01 p15. http://www.sicc.sk.ca/saskindian/a02win15.htm. Retrieved 2009-09-20. ↑ "Steele Narrows Provincial Park - Tourism, Parks, Culture and Sport -" (pdf). Brochure of the Northwest Rebellion. Government of Saskatchewan. http://www.tpcs.gov.sk.ca/SteeleNarrowsBrochure. Retrieved 2009-09-20. ↑ "Makwa". Sasl Biz community profiles. Enterprise Saskatchewan Government of Saskatchewan. http://www.saskbiz.ca/communityprofiles/CommunityProfile.Asp?CommunityID=598. Retrieved 2009-09-20. ↑ "Regina History Guide Tour". Saskatchewan Genealogical Society - Regina Branch. http://www.rootsweb.ancestry.com/~canrbsgs/pages/tour.html. Retrieved 2009-09-20. ↑ "RCMP traditions centre in Regina" (republished online Saskatchewan News Index 1884-2000 University of Saskatchewan Libraries.). Top News Stories Beginnings and Landmarks. Leader-Post. May 16, 1955. p.13. http://library2.usask.ca/sni/stories/beg24c.html. Retrieved 2009-09-20. ↑ "History of the Royal Canadian Mounted Police". Mounted Police Post. http://www.mountieshop.com/new/history.asp. Retrieved 2009-09-20. ↑ "Explore Our Heritage; Louis Riel 1844–1885". CHTS Home Manitoba Heritage Council Commemorative Plaques. Government of Manitoba. http://www.gov.mb.ca/chc/hrb/plaques/plaq0990.html. Retrieved 2009-09-20. ↑ "Manitoba History Red River Resistance". Number 29, Spring 1995. Manitoba Historical Society.. 1998-2009. http://www.mhs.mb.ca/docs/mb_history/29/redriverresistance.shtml. Retrieved 2009-09-20. ↑ "Scenic Routes – The Louis Riel Trail". Tourism Saskatchewan. Government of Saskatchewan. http://www.sasktourism.com/default.asp?Page=175&menu=52. Retrieved 2007-09-24. Barkwell, Lawrence J. (2005). "Batoche 1885: The Militia of the Metis Liberation Movement". Winnipeg: Manitoba Metis Federation. ISBN 0-9683493-3-1. Flanagan, Thomas (2000). "Riel and the Rebellion: 1885 Reconsidered" (Google online books). Toronto: University of Toronto Press. ISBN 0-8020-4708-4. http://books.google.ca/books?id=4u4RGj742v0C&lpg=PR1&ots=4fumtk1ApS&dq=Riel%20and%20the%20Rebellion%3A%201885%20Reconsidered&pg=PP1#v=onepage&q=&f=false. Retrieved 2009-11-16. Mulvany, Charles Pelham (1886). "The History of the North-west Rebellion of 1885" (Google online books). Toronto: A.H. Hovey & Co.. http://books.google.ca/books?id=_0-Rd0Y1Q8oC&ots=epUvAKBBuh&dq=The%20History%20of%20the%20North-west%20Rebellion%20of%201885&pg=PP3#v=onepage&q=&f=false. Retrieved 2009-11-16. Morton, Desmond (1972). "The last war drum: the North West campaign of 1885". Toronto: Hakkert. ISBN 0-88866-512-1. Reid, Jennifer; Long, Charles; Carrasco, David (2008). "Louis Riel and the Creation of Modern Canada: Mythic Discourse and the Postcolonial State" (Google online books). Albuquerque: University of New Mexico Press. ISBN 978-0-8263-4415-1. http://books.google.ca/books?id=hgJwXcKKK4oC&lpg=PP1&ots=oKxsAZQawA&dq=Louis%20Riel%20and%20the%20Creation%20of%20Modern%20Canada%3A%20Mythic%20Discourse%20and%20the%20Postcolonial%20State&pg=PP1#v=onepage&q=&f=false. Retrieved 2009-11-16. Stonechild, Blair; Waiser, Bill (1997). "Loyal Till Death: Indians and the North-West Rebellion". Calgary: Fifth House. ISBN 1-895618-88-6. Beal, Bob; Macleod, Rod (1984). "Prairie Fire: The 1885 North-West Rebellion" (Google online books). Toronto: McClelland & Stewart. ISBN 978-0-7710-1109-2. http://books.google.ca/books?id=BJgMAAAACAAJ&dq=Prairie+fire:+the+1885+North-West+Rebellion&hl=en&ei=ZChlTb7eBsb3gAeb84yEBw&sa=X&oi=book_result&ct=result&resnum=1&ved=0CCoQ6AEwAA.